Training scenarios and simulations are a great way of building confidence. Lazarus Training can help your staff maintain the confidence that comes from hands on practice. We have a training ethos #trainforreal, this means that the training should be as close to real as possible, both in the type of incident, but also with the casualty simulation and “scripting” necessary to make the training experience life-like. Lazarus Training has a strong track record of training scenarios and simulations as part of its media first aid training. We can run stand alone medical scenario events at all different training levels or include medical treatment within your own training. Either way there is always a robust plan to ensure your delegates and your organisation get the most out of the event. Lazarus Training ensures prompt and appropriate feedback via its own documentation, trained observers and if desired/cleared the use of recording equipment such as camcorders. This can be used to show the situation from both the rescuers point of view or the casualty. We take great care in preparing our training scenarios and simulations, taking the time to develop “movie style” techniques for our casualty simulation used in our training. 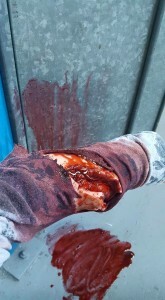 When training scenarios and simulations are done properly they can narrow the gap between the training course and the initial shock of encountering a real casualty.